My husband and I reached out to Cynthia for help with the many challenges we were facing in parenting our 12-year-old son. The first major problem we wanted to address was our son’s insistence on playing video games and his subsequent yelling and use of negative language when we tried to get him to stop. From the outset, my husband and I weren’t on the same page about how to handle this issue. My husband approached our son with anger, while I argued with him and eventually give in. I noticed that I would often put my husband in the position of having to be the “bad guy” in order to make our son comply. Needless to say, my husband wasn’t happy about playing this role. The relationship between my husband and our son began to suffer, and the conflict negatively impacted our relationship as a couple. We knew that we needed a more effective approach, and with Cynthia’s support and expertise, we were able to create a plan of action. After two months of working together, our situation has improved dramatically. Here is how we were dealing with this problem before making changes. 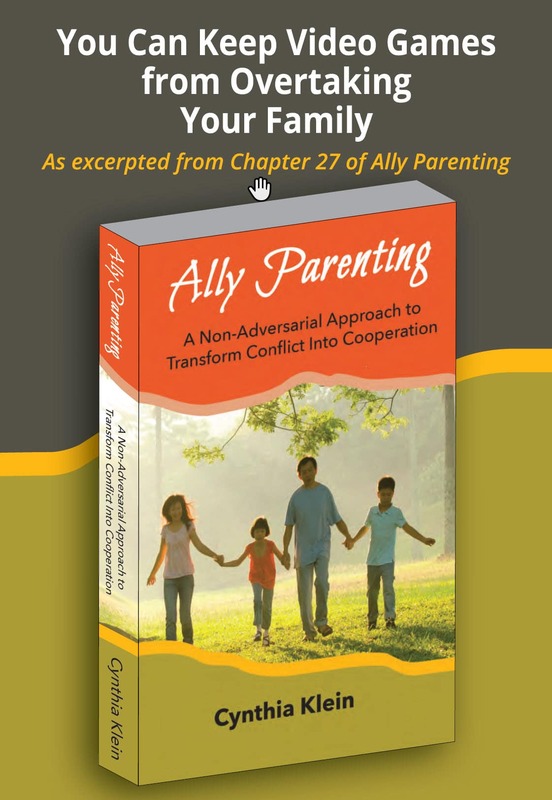 After the conflict, my husband and I examined with Cynthia what our thoughts, feelings, and behaviors regarding our son and each other were that created more conflict. For instance, since our son was swearing at me, I had to look at the ways in which I was part of the problem, rather than just continue to tell him to stop. Instead of blaming our son, my husband and I took responsibility for creating change by changing ourselves first. My husband and I also resorted to taking away items and privileges and sending our son to his room as a means to punish him and gain power over him. My husband would get frustrated and angry, which led to yelling and giving warnings. We eventually discovered that neither of us knew how to listen to our son’s thoughts and feelings. Frequently, we used communication blocks, which caused our son to see us as his adversaries and feel that he was totally at fault. Making changes has been difficult, so we needed frequent support from Cynthia to discuss our problems and develop solutions together. Here are some of the changes we made that turned our conflict around video gaming into more respect for the rules and easier enforcement of the rules. We talked to our son about our communication blocks and received feedback from him on what we needed to change. After this conversation, our son realized we were serious about changing ourselves. I also acknowledged that I hadn’t been sticking to guidelines because I would get intimidated by our son’s anger and give in, so I developed the skills to stop arguing. I learned that fewer words are better, although it takes constant awareness and effort to remember this. I also realized that I had been giving too many commands and saying “no” too often, so I stopped this behavior. We had collaborative family discussions about the evening routine. Even though this wasn’t directly related to setting gaming limits, the discussions improved the relationships within our family. Cynthia taught us that when kids feel better about their parents, they are more likely to collaborate. Now, we’re learning to become an ally to our son rather than an adversary. The changes we’ve made have created so many positive results in our family. We no longer allow video gaming Monday through Thursday. Whereas our son used to continually ask for his device and become angry, belligerent, and argumentative when he didn’t get it, he no longer even asks for the device during the Monday through Friday time period. The rules have made our son feel more secure and breathe a sigh of relief. Since he now understands that gaming is reserved for the weekends, he doesn’t push back anymore. The guidance we received from Cynthia enabled my husband and me to be on the same page about our parenting. I’ve learned that our son is happier when we calmly set and follow through with clear rules and expectations, and so are we. We are now working as an Ally Parenting team. I am continuing to watch out for giving in to my son when I feel sympathy for him and I want him to feel better if he is sad. This does not help…. so it’s continual self-reflection and practice to stay strong and look at the long-range picture.